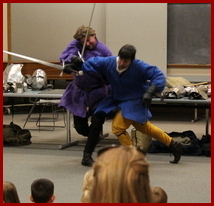 Knights of Veritas combat presentations offer entertainment, excitement and enlightenment. It has only been in recent years that modern translations and interpretations of surviving medieval combat manuscripts from the 1300s and 1400s have made the otherwise lost authentic medieval combat arts accessible to modern practitioners. Contrary to popular belief, medieval swordsmanship was intelligent and deliberate, taking advantage of natural physical laws such as geometry and leverage. The knights of history fought with deadly and efficient arts, rather than the brute-strength battering most people are familiar with from movies, television, games and other forms of media entertainment. Violence is de-glamorized in Knights of Veritas presentations, as audiences realize that wielding a weapon against another person is not to be taken lightly, and that back then, just as today, using force carried both responsibilities and consequences. Drawing from historical techniques contained within period manuscripts, Knights of Veritas creates demonstrations of how and why the techniques work. Authentic moves are choreographed for safety, first with a full-speed version given, followed by a slow-motion version of the same movements with detailed explanations. 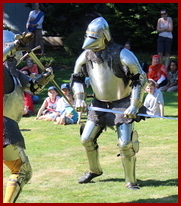 Several examples of unarmoured combat technique are demonstrated while wearing authentic medieval clothes accurate in both materials and design. Armour is then added to to illustrate what changes and what stays the same when facing an armoured foe. Our audiences are compelled to think critically about what they believe they've learned about medieval combat from entertainment sources such as movies and TV. Safety is paramount for Knights of Veritas, and it is always emphasized that the techniques demonstrated at our presentations are not to be tried at home (or anywhere else)! Those who are interested in learning more are welcome to visit Veritas Swordplay Academy.